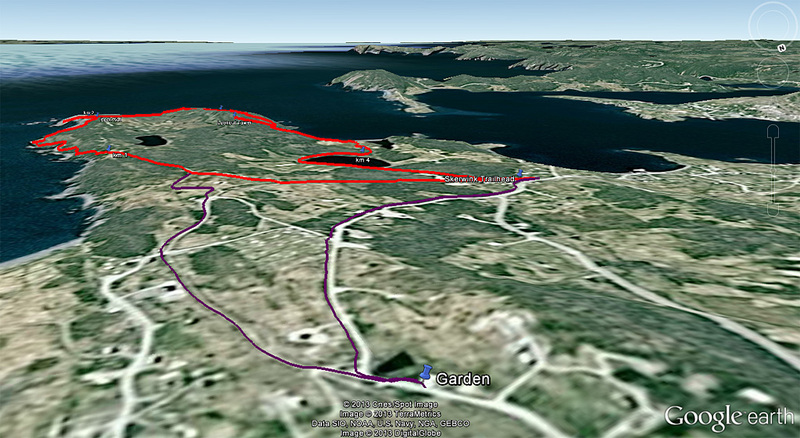 The Trinity/Port Rexton area is a 3 3/4 hour from downtown St. John’s. The Skerwink Trail, amongst other local attractions, is an excellent excuse for making your way out to this part of the countryside. We had the opportunity to stay at the Fishers Loft Inn during our visit to the area, which proved to be an ideal launch point to get to the trail. This trail is just over 5kms in length, but the vistas will inspire you to take long breaks and soak in the wind, waves, land and seascapes – allow at least 2 hours to truly enjoy the experiences that this trail has to offer. While being very well maintained, both in terms of trail surface, walkways and staircases, only limited sections of the trail would be considered friendly for those with mobility concerns. The trail is not wheelchair accessible and the number of staircases might prove daunting to certain folks. Having said this, given the length of the trail, and relatively limited elevation gain, I would rate this trail as being easy to moderate (in contrast with the trail stewards who rate this as moderate to difficult). Hiker safety was clearly on the minds of the stewards of the trail. Ample signage, both for directions as well as safety notices, can be found everywhere. Trail surfaces are clear and often made up of compacted crushed stone. Boardwalks are covered with a fine metal screen to provide additional traction, and staircases or bridges can be found anywhere you might hope to find them. Stay on the trail, look where you step, and you will have a great time! The first kilometre will take you through a pine forest until you reach your first seascape. From there, the next 3 kms provide multiple coastal vistas* until you reach White Cove, after which the trail retreats inland to take you back to the trailhead. * it is possible to avoid the coastal section by taking the inland bypass trail, but that would almost defeat the purpose… so much of the beauty of this area would be missed! 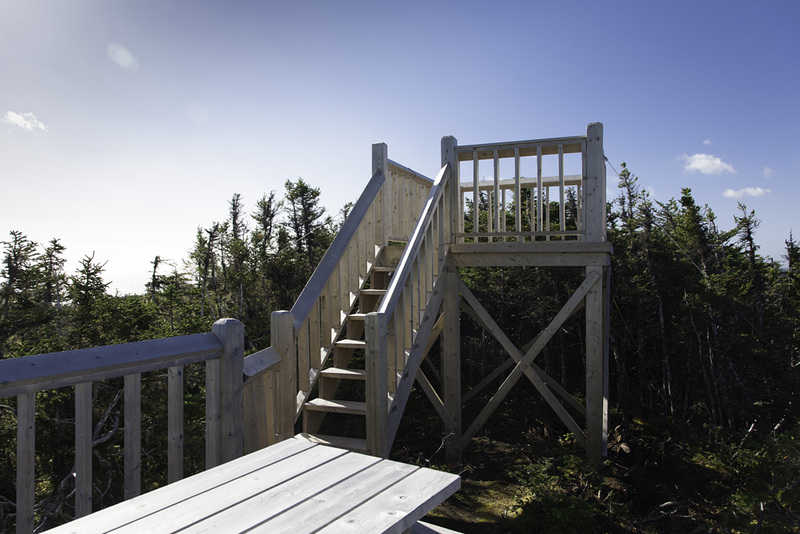 As you near the end of the coastal section of the trail, an option to go to the lookout tower will appear just beyond the 3km mark. It is a short jog straight uphill (13om in distance, 28m in elevation gain) – so take a break if necessary on the way up, the views are worth it. A small clearing, picnic table and platform await you at the top. I had to brace myself against the strong winds found up there while taking pictures, so hang on to your hats! The trailhead proper can be accessed via Rocky Hill Road off Hwy 230. The trailhead (well signed) will be on your left. A parking lot will be on your right, just beyond the trailhead (again, well signed). If you are staying at the Fishers Loft Inn, you can either make your way to the trailhead via Halfway Hill Road, or you can make a bee line for the trail by walking down Mill Road until it joins an old railbed. Follow the railbed until you get to the big yellow house. A sign will guide you to walk left around the private property, then making a quick right once you reach the corner of the property. The Mill Road/railbed option is a bit trickier to follow, but depending on the time of year, you could be rewarded with the berries that you might find along the way. My gps map of the trail. The trail proper is in red, while alternate routes from the Fishers Loft Inn appear in purple. Two waypoints (Inland 1 and Inland 2) denote the junctions for the Inland Trail coastal bypass. The images in this photo gallery were taken during two separate outings in September, 2011 and show the moods that the weather has to offer. Woah, looks like an incredible experience! Good eye at giving us an impression of scale on the landscape shots.